Hi, I'm Pam and thank you for visiting my blog. I have been making cards for over 10 years and am an independent demonstrator for Creative Expressions. I am lucky enough to teach on cruise ships and also get the chance to demo at The Big Stamping and Scrapbooking Show at Alexander Palace. I run workshops for a local craft shop and if anyone would like details of the them please e-mail me at stephen.smith870@ntlworld.com I love to scrapbook but my all time favourite thing is to get messy with ink! Another Wednesday, another WOYWW! Hope everyone is well and the Christmas Card preparation is in full swing! Here's my desk this week. I'm working on a Design Team project for Creative Expressions using some beer mats that I "liberated" from a pub a while ago! There's an empty cup, lots of Distress Inks, the Winter Flowers stamp set and of course, my trusty paper trimmer. In answer to a question a few weeks ago, there are 4 bone folders in the tub (I don't know why there's that many!). I have been making Christmas cards and I've got a very quick and easy one on the Creative Studios Design Team Blog today (the link is Sam Poole on the right). The full step by step is there but here's the finished thing. And the final picture is.....the sweetest kitten in the world...fact! It's Dr Gonzo! He's laying on his favourite fleecy blanket and cuddling a knitted toy. He loves having something to cuddle. My daughter has just got Dr Gonzo a goldfish to watch swimming around and he's fascinated by it. Well, the vet did say to try and stimulate him with interesting things! I'm going away on my travels next week so although I won't be able to join in with WOYWW I'll still be blogging, hope you'll pop by for a visit. We're down to the final 9 followers for the blog candy...if it happens while I'm away, I'll do the draw when I get back. There's going to be a blog hop next week with all the Creative Expressions Design Team taking part and prizes on offer. 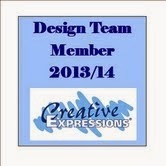 Have a look at the Creative Expressions website news (there's a link on the right) for details. It's to celebrate the launch of a brand new product...watch C&C on about 15th/16th November. There's lots of gorgeous samples that the team have made for the shows. So, until next time, have a very happy week and many thanks for your visit. I'll get round as many desks as I can before I go away. Love the Christmas card - real wintery colourings. Well done. Have fun with the liberated beer mats!! You got the cat a fish! I love it! Sat here laughing and the dog is looking at me oddly! Love his name too - what a cutie! p.s I made ONE Christmas card weeks ago and am still basking in the smugness that I managed that! Hi there. Just popping my head round the door to say hi. Thanks for the peek into your creative world today. Hope you have a good week too. That's a nice Christmas card, I like the colors. Pam, that Christmas card is beautiful, Is it just on stamp or a combination? Love that kitty! And, those stammps are interesting. Never seen any like that. Happy WOYWW! Dr Gonzo is so sweet, give him a tickle under the him from me. Lovely card - enjoy your cruise. That is a lovely card. Such a cute kitten too. A lovely card thank you for sharing all your skills, knowledge and ideas. love the idea of the wall hanging. 4 full projects...all materials and tools supplied. At home! Next Crafty Sunday is 23rd August, 10am-4pm. Come anytime between those hours and stay as long as you want. An Excuse to Visit the Pub!